Why is X-ray Inspection Technology So Important in PCB Assembly? X-ray inspection technology, usually referred to Automated X-ray inspection (AXI), is a technology used to inspect the hidden features of target objects or products with X-rays as its source. Nowadays, X-ray inspection is widely used in lots of applications such as medical, industrial control, and aerospace. As for PCB inspection, X-ray is massively used in the process of PCB assembly in order to test the quality of PCBs, which is one of the most important steps for quality-oriented PCB manufacturers. Nothing can be loved blind. 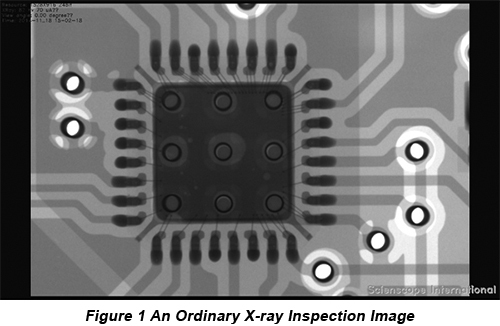 So this passage will tell you why X-ray inspection technology is so important in PCB assembly. In recent years, area array packages including BGAs and QFNs, flip chips and CSPs are widely used in all kinds of fields such as industrial control, communication, military industry, aerospace etc, making solder joints hidden under the packages. This fact makes it impossible for traditional inspection devices to play their role perfectly in PCB inspection. In addition, since the appearance of surface mount technology (SMT) that makes both packages and leads become smaller, traditional inspection methods including optical, ultrasonic and thermal imaging are insufficient because PCBs have higher density with their solder joints hidden and holes buried or blind. Besides, with the increasing miniaturization in terms of semiconductor components package, while considering X-ray inspection system, the trend of both present and future component miniaturization can' t be neglected. Compared with other inspection methods, X-ray is capable of penetrating into inner packaging and inspecting the quality of solder joints. That's why it is picked up. X-ray has a unique advantage that is materials absorb X-rays proportional to their atomic weight and all materials absorb the X-ray radiation differently depending on their density, atomic number and thickness. Generally speaking, materials made of heavier elements absorb more X-rays and are easily imaged, while materials made of lighter elements are more transparent to X-rays. Therefore, an ordinary X-ray inspection image is shown as Figure 1. From this figure, the dark black image refers to the material made of heavy elements while the transparent or relatively white image refers to the material made of light elements. Therefore, X-ray inspection is good at inspecting hidden defects including opens, shorts, misaligned, electrical components missing and so on. a. X-ray tube. It is capable of generating X-ray. b. A sample operation platform. It is capable of moving with a sample in order to make the sample inspected from different angles and magnification adjusted. And oblique angle inspection can also be done. c. A detector. It is capable of catching the X-ray through the sample and converting it into the image that can be understood by users. The inspection principle of all X-ray inspection devices is X-ray projection microscope. The process starts with the generation of X-ray by X-ray launching tube passing through inspected PCBs. Since different materials have different X-ray absorption based on the differences in terms of material and atomic number. Projection is generated on detectors and the higher the density is, the deeper the shadow will be. The shadow will be largely close to X-ray tube and vice versa. Therefore, the ideal X-ray inspection system must have clear X-ray images so as to provide the information in the process of defect analysis. For this goal, an X-ray inspection system must have sufficient magnification to meet the present and future needs. Besides, for the analysis of BGAs and CSPs, oblique angle inspection function must be available. Because without it, solder balls can only be inspected from right above so that the more detailed information for analysis would be lost concerning the size and thickness of solder balls.